So after those weeks of further speculation and rumour, the HTC One Max becomes official today. Since the launch of the HTC One the ‘One’ brand has become one of the most recognised in HTC history and by adding the HTC One Max to the existing line-up HTC hope to provide consumers with even greater choice. The HTC One Max brings with it the a new version of HTC Sense, this time we have 5.5 which builds upon version 5 found on the One and One Mini. Sense 5.5 adds new Blinkfeed features with the ability to now add RSS feeds and a variety of other services. There’s also the ability to read feeds off-line thanks to a caching mode. The Gallery app has been updated with new ‘view by event’ and added Zoe capability, being able to share Zoe moments with non-HTC devices. There’s a GIF editor and new video highlight options. In terms of hardware the most obvious thing is the 5.9 inch full-HD display which is glorious! As with the HTC One, there’s a Quad-Core 1.7GHz Snapdragon 600 CPU, 2GB RAM and either 16 or 32GB of storage. In a change from the HTC One, the Max has a microSD card slot under the removable back over and supports up to 64GB memory cards. 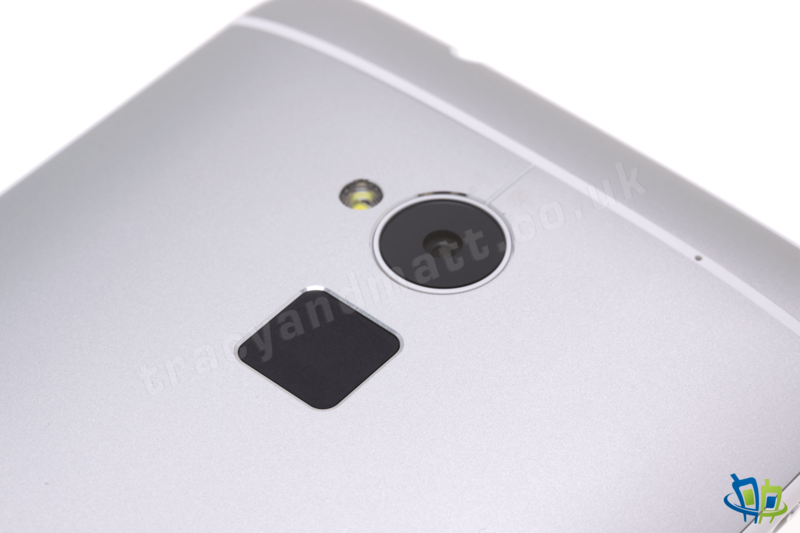 On the back you’ll find the same 4MP Ultrapixel camera as seen on other One models, which is a good thing. Below the camera, and settling the speculation, you’ll find a square panel which is a capacitive fingerprint reader. The nice feature here is that you can enrol multiple fingers on the device and allows you to set a specific finger to launch straight into a specific application. Handy. Powers is supplied by a sizeable 3300MAh battery which can be further supplemented by a 1100MAh battery in the dedicated HTC One Max cast that HTC have developed. The HTC One Max will go on sale later this week and should be in Vodafone stores first. No word on the price as yet but expect the networks to be making announcements later today too. There’s plenty to talk about with the HTC One Max so I’m starting off with the unboxing and hands-on video below. It’s pretty lengthy so be sure to make yourself comfortable. I also have another demo video coming up later where I’ll cover some of the other features and there’s a gallery of hi-res images for you to enjoy too.